A Valentines Day card is a must have for celebrating the season of love. But why make and send the same ol’ boring card? Why not send a unique valentine greeting card this time around? So what’s so unique about this valentine card? 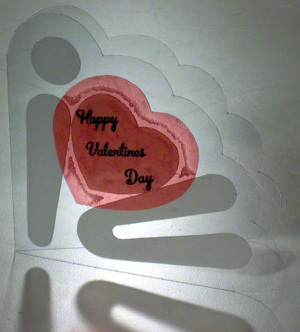 Most cards are made from opaque materials while this love card is made from see through materials. This is one of the many ways to create unique cards. Unlike the other transparent plastic materials used on this card, the red one is similar to projector sheets that have a grit side for friction. Hence, you can write, draw, erase, or use copier and printer on this sheet. These activities are not that easy to carry out on other types of plastic materials. 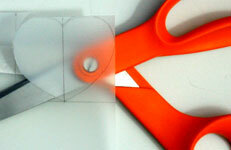 On the red transparent sheet, draw and cut out a heart shape of 3” x 3” approximately. 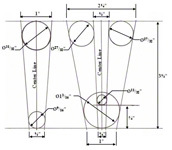 On the frosted report cover sheet, draw and cut out a heart shape of 2.25” x 2.25” approximately. Even though these heart shapes were simply hand drawn, various types of heart templates are available in the craft stores. On the same frosted report cover sheet, use the circle punch to create the 1” diameter circle for the dot on top of the letter i. Then, on the same sheet, draw and cut out the rest of the tapered letter "i." It’s 3.5” high with about 0.5” diameter bottom and almost 1” diameter top. Next, on the same frosted sheet, draw and cut out the tapered letter "u." 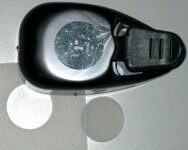 It’s 3.5” high with about 1.25” diameter bottom and almost ⅞” diameter fingertips with 0.5” gap in-between the fingers. Don’t feel like drawing all these letters? Then, download the free template for that. By the way, the link opens in a new window. Whether you download our free template or create your own, you can temporarily tape it on the frosted sheets. And, hence, use it to cut out the letters. This saves you the time of worrying about how to draw on, and clean, the plastic sheets afterward. Score and fold the 5.5” x 11” transparent sheet into a 5.5” x 5.5” card. 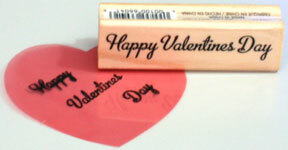 Use the rubber stamp and ink pad to print “Happy Valentine’s Day” on the red transparent sheet. Peel one side of the glue sheets, stick them on the back of the letters and shapes, then trim off the excess glue edges. Next, peel the other sides of the glue and place the frosted letters and shapes on the love card leaving about 0.25” bottom-left-corner margins and 0.5” top margins. The frosted heart shape is basically edge to edge and between the letters i and u, forming a curved "i♥U" on the Valentines Day card. Then, do the same for the red transparent heart shape and glue it on the frosted heart shape with about ⅜” margins around the frosted heart shape. Finally cut out the curved scallop open edges of the love card that follow the mounds of the curved letters and shapes with about 0.5” margins. For this unique Valentines Day card project, it might be easier to either draw out or cut out and glue ordinary paper sheets as a prototype. 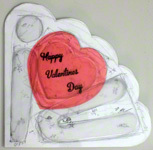 Then put the paper sketch or prototype inside the folded transparent Valentines Day card and use it to know where to place the frosted pieces for the project. 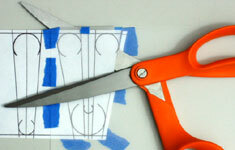 Additionally, use this tool to trace-cut the curved scallop open edges.